Black British musicians have been making jazz since around 1920 when the genre first arrived in Britain. 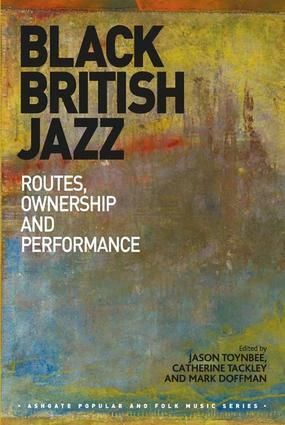 This groundbreaking book reveals their hidden history and major contribution to the development of jazz in the UK. More than this, though, the chapters show the importance of black British jazz in terms of musical hybridity and the cultural significance of race. Decades before Steel Pulse, Soul II Soul, or Dizzee Rascal pushed their way into the mainstream, black British musicians were playing jazz in venues up and down the country from dance halls to tiny clubs. In an important sense, then, black British jazz demonstrates the crucial importance of musical migration in the musical history of the nation, and the links between popular and avant-garde forms. But the volume also provides a case study in how music of the African diaspora reverberates around the world, beyond the shores of the USA - the engine-house of global black music. As such it will engage scholars of music and cultural studies not only in Britain, but across the world. Jason Toynbee is Senior Lecturer in the Department of Sociology at The Open University, UK. His research focuses on creativity and ethnicity in music. Jason’s most recent books are Bob Marley: Herald of a Postcolonial World? (2007), and as co-editor Migrating Music (2011 with Byron Dueck). He led the AHRC funded research project ’What Is Black British Jazz?’ at The Open University. Catherine Tackley is Senior Lecturer in Music at The Open University, UK. She is author of The Evolution of Jazz in Britain, 1880-1935 (Ashgate, 2005) and Benny Goodman’s Famous 1938 Carnegie Hall Jazz Concert (2012). Catherine is currently leading the AHRC-funded network ’Atlantic Sounds: Ships and Sailortowns’ and is a co-editor of the Jazz Research Journal. Mark Doffman researches and teaches in the Faculty of Music at the University of Oxford, UK. His research interests lie around creativity, psycho-social dynamics in music performance, temporality in music, and jazz performance. In addition to his research and teaching, Mark continues to perform as a jazz drummer.